Climb inside our 2014 Jeep Patriot Sport SUV shown in a stunning Black Clear Coat exterior finish. This economical machine is purebred Jeep and is motivated by a proven 2.0 Litre 4 Cylinder that produces 158hp while tethered a fun-to-drive 6 Speed Automatic transmission for easy passing power. This Front Wheel Drive team helps our Patriot secure near 8.1 L/100km on the open road. Our SUV comes with electronic stability control to help you stay sure-footed in any road condition. Combined with the agile suspension, this Jeep offers capabilities that other SUVs just can't produce. Enjoy body colored bumpers, fog lights, and roof rails that leave an aggressive stance of pure Jeep in your parking spot. Once inside our Sport trim, you'll appreciate cruise control, comfortable cloth seating, a 60/40-split-folding rear seat, illuminated cup holders and a four-speaker sound system with a CD player and an auxiliary audio jack. Settle in for a new adventure! 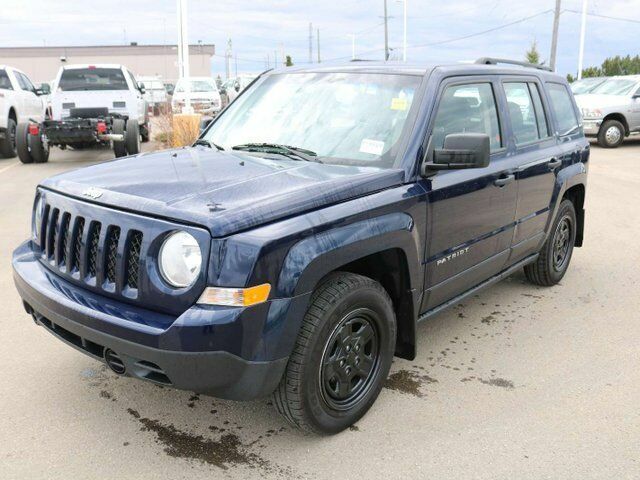 From multi-stage airbags to side curtain airbags and stability control, this Jeep Patriot has the capabilities to protect its occupants on or off road in almost any driving condition. Jeep spends time, resources, and enormous energies to make sure that each safety component is tested over and over again to ensure you have the best surrounding you. So it's time for a change, it's time for a Jeep Patriot - Print this page and call us Now... We Know You Will Enjoy Your Test Drive Towards Ownership! AMVIC Licensed Dealer.